We have an upcoming event that I think may be of interest to your members. I was hoping we could get onto your calendar of events. Thank you in advance. “Big Brothers, Big Sisters of St. Catharines-Thorald District and Sons of Anarchy are Takin' Over Dover! ALL proceeds from the event will go directly to the Game On! group mentorship program designed to encourage physical activity participation, healthy eating choices and the development of positive body image amongst boys ages 12-14 in our community. 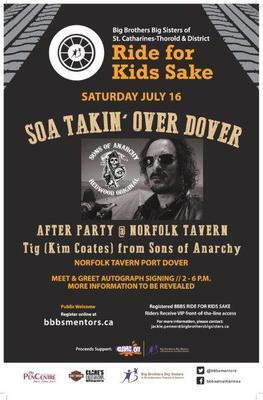 We are thrilled to welcome Son’s of Anarchy actor Kim Coates (Tig) for the 3rd year in a row as a celebrity guest and supporter of Ride for Kids Sake.